iTero Digital scanning for Invisalign at Orthodontics at Don Mills in Toronto. 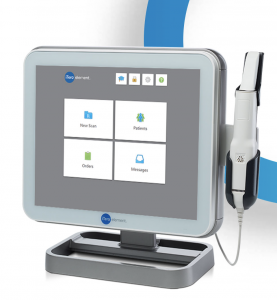 In our quest to provide our patients with the latest cutting edge technology, the iTero Element intraoral digital 3D scanner by Invisalign is the latest new technology available at Orthodontics at Don Mills in Toronto. Our patients can now avoid the messy and gooey dental impressions previously taken during their Invisalign treatment and study models. It is the cutting edge in technology and aligns with our mission in providing our patients with the latest and best technology. In only approximately 5-10 minutes, a detailed and accurate 3D image of your mouth is captured for immediate viewing! This avoids the gagging associated with dental impressions and allows us to accurately treatment plan on the spot. If you have any questions about the iTero element or digital scanning for your Invisalign treatment in Toronto, please don’t hesitate to call Orthodontics at Don Mills at 416-447-1515 for your orthodontic needs. The team at Orthodontics at Don Mils is here for you! We would be delighted to meet you for a complimentary consultation.